Wednesday, April 24, 2019 • R.I.P. Edition • Bring your own straight jacket. 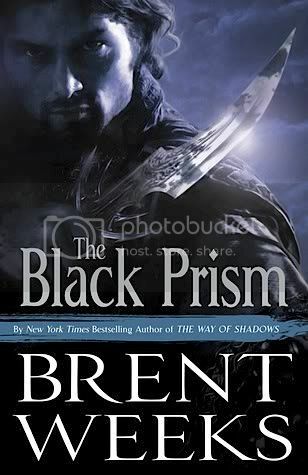 Author of The Night Angel trilogy, Brent Weeks brings us a new world and new cast of characters to fall in love with in his new trilogy. The Black Prism might be more high fantasy than the sword and sorcery style of Night Angel, but it doesn't skimp on the action. I have to admit I am a bit jealous that I didn't think of the way he uses magic in this book first. As a photographer it's right up my alley with all of the uses of the color spectrum. Although the way they use the light for magic does remind me (also a comicbook reader) of green lantern a bit. It really didn't distract me and of course wasn't exactly the same, especially when you add in the mythology, emotional connections and other details. Story-wise it could come across as magic heavy to some, the magic is not only a big part of the world, but part of the plot as well. But I think Weeks does a great job maintaining the balance here and working it into a fantasy world moving into flintlock weapons. Really the only small issues I had with the book was a bit of confusion with the interplay between the brothers; going back and forth between their names at key times. You'll know what I mean when you read the book. And near the end, characters on either side of the struggle seemed to "know" too much. People they had never met were instantly recognizable as the kids of people they hadn't seen in almost two decades; who was taking whose side. I realize the idea of spies were mentioned quite a few times, but it didn't seem to quite fit a couple times. (Though it could come together later I suppose) All in all, my issues didn't unravel the fantasy for me so they were very minor. All in all I loved the various balls he had in the air in this story. I always fall in love with great characters in a story first and he had them in spades. (Probably the only fantasy story I can think of where the main character is grossly out of shape.) Outside of a rich fantasy world and magical structure I found interesting he also worked in all the political intrigue one would expect of a book dealing with nations and powerful individuals . But mostly I was impressed with the way he managed the twists and turns of the plot. I didn't think anything came off as forced or cheesy and always led to deeper interest in the story and characters. Looking forward the next volume. If you liked Weeks' last trilogy "Night Angel", there is no reason not to pick this one up. It carries the same great action and characters in a world that is even more fleshed out (or at least more extensively mixed in).